After last years very successful and joyous Tibetan Uchen Calligraphy Retreat, Tashi presents a unique opportunity to thoroughly learn the art of Tibetan Umed handwriting. Again held in the conducive and beautiful border countryside of Wales. During the six-day (seven nights) calligraphy meditation retreat, Tashi will instruct how to properly construct the Tsugtung Umed script, from the foundation of the alphabet through to the many subjoined letters, onto forming words and sentences in a coherent and beautiful formation. The remaining days of the course will focus on forming traditional mantras as well as seed syllables as a useful aid to Buddhist visualisation practices. There will also be meditation instruction and daily sitting practice that will help calm and prime the mind for the optimum approach and application, which is considered at the core of learning and creativity. 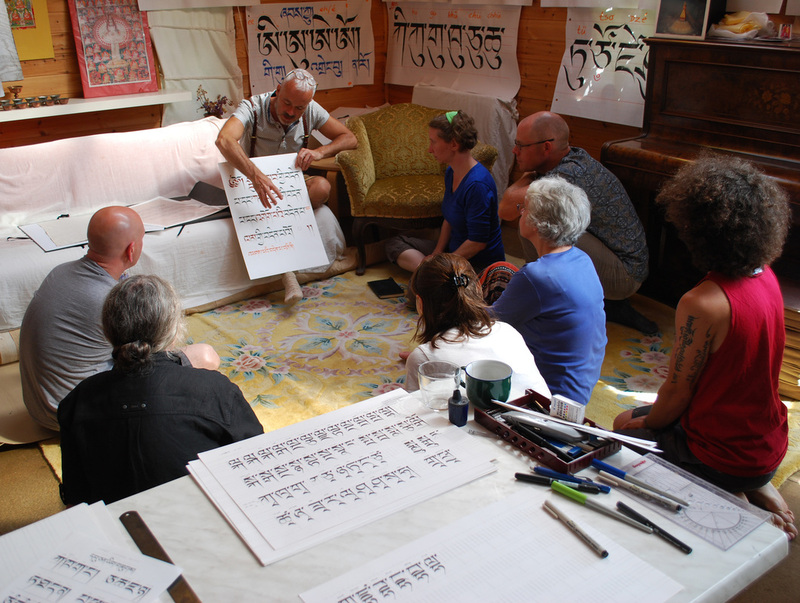 For the more dedicated practitioner, this course provides a discipline that lays a firm foundation in the art of Tibetan calligraphy. Suitable for beginners as well as those who wish to improve their already acquired handwriting skills. It would be helpful for first-timers to at least become familiar with the Tibetan alphabet in the Uchen script before attending the course. Location: The blessed abode of Karma Dechen Choling at New Inn Brilley is situated on the Welsh, Herefordshire border. 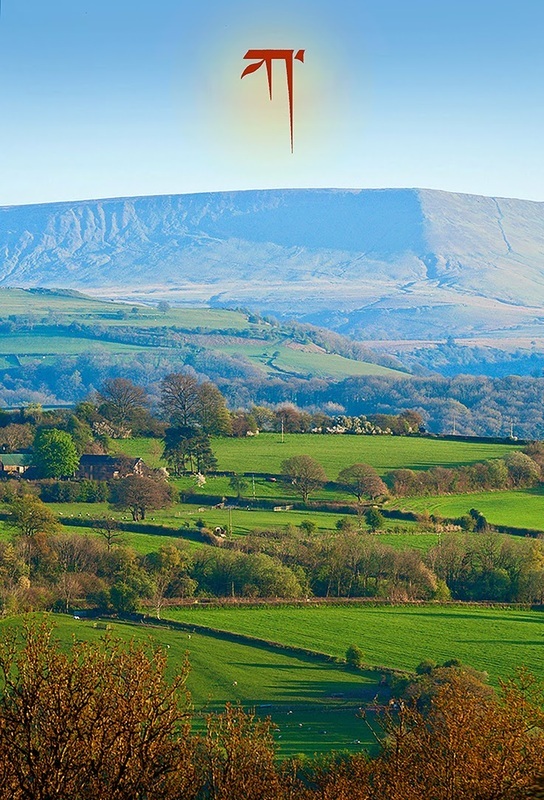 Described as being ‘unique, authentic and a little bit quirky’ it boasts magnificent views across the Wye valley toward the majestic Black Mountains of the Brecon Beacon National Park, that evokes an ideally peaceful retreat atmosphere of clarity and focus. Alastair Sawday B&B award winning New Inn at Brilley offers a variety of charming accommodation options to suite most needs, from camping, shared dormitories to the 'Self-catering suite' (though you will be catered for during the retreat) as well as the luxury of the Rose Pink and Mustard Yellow double bedrooms in the old Inn. Please see price tariff below. To choose the type of accommodation you would be most comfortable with, please look into the website of New Inn Brilley. Please note that the Rising Sun, Wagon over the Valley, Angles and Mother Earth accommodations are not available in the calligraphy retreat package, all other accommodation types have been kindly offered at a 20% concession, making the course more affordable for all. It may also be possible to book accommodation before and after the official course schedule, however costs will be at the regular prices as stated on the New Inn Brilley website. There are also local B&B’s within a few minutes drive as well as many more in the near-by picturesque town of Hay-on-Wye, see below for course fees for ‘Attending course from outside of New Inn’. Two people sharing same double - £485 each. booking deposit: £194 GBP each. Meals and refreshments are included in the course fee. Please let known any special dietary requirements prior to your visit. Food will be vegetarian. Cancelations: booking deposit will not be refunded after June 16th. How to get there: By public transport, the nearest Local train station is Hereford with direct links from London Paddington. Across from Hereford station concourse is a local 39 bus, Brecon service*1 alight at Hay-on-Wye, taxi*2 ride of 8 minutes from Hay-on-Wye to New Inn at Brilley.Please follow the link for map and directions by car. What to bring: As the British weather is unpredictable, you may need clothing to suit cooler wet days to pleasant hot dry days, so flip flops and Wellington boots. Please bring personal art materials, such as calligraphy pens*3, a straight rule, pencil, pencil-sharpener and eraser. Three to four A3 size pads preferably water-colour paper is advised, as working on a larger scale is better for learning and for best results. 3* Suggested pens can be a range of different size italic felt tip calligraphy pens, or more professional Pilot Parallel Pens in a range of different nib sizes, available on the Internet with ink cartridges. Artist of contemporary Tibetan calligraphy and iconographyinkessentialUnited KingdomTashi is an Englishman who set out on his path in the arts and meditation at the tender age of 11. Shortly after he finished his formal art degree training, he became a Buddhist monk in the Tibetan Karma Kagyu order. For the next 17 years he studied under a Tibetan master of arts called Sherab Palden Beru, apprenticing in the elaborate art of temple decoration and Tibetan calligraphy. In his finishing years as a monk, Tashi studied under a master of the rare ancient Sanskrit forms, namely Lantsa and Wartu in Dharamsala. Since the beginning of the Millennium, Tashi has been actively creative in Tibetan calligraphy and iconography, established as an internationally known artist. This blog is to share knowledge on Tibetan related scripts, upholding the integrity of their ancient heritage, through a concern in conservation and preservation and to communicate Dharma; is very much at the heart of Tashi's work as an artist. 8 am sitting meditation followed by breakfast between 8.30 and 9.30 am. 10 am Welcome and Introduction talk. 4.20 pm Meditation explanation and practice. 7 pm supper and free time until bed. 4.20 pm meditation and calligraphy practice/talk. 8 am sitting meditation followed by breakfast between 8.30 and 10 am.